Exciting information about health and wellness updated every week! Today’s blog post is brought to you by our monthly science based nutrition newsletter! The information is too good not to share. Please enjoy! 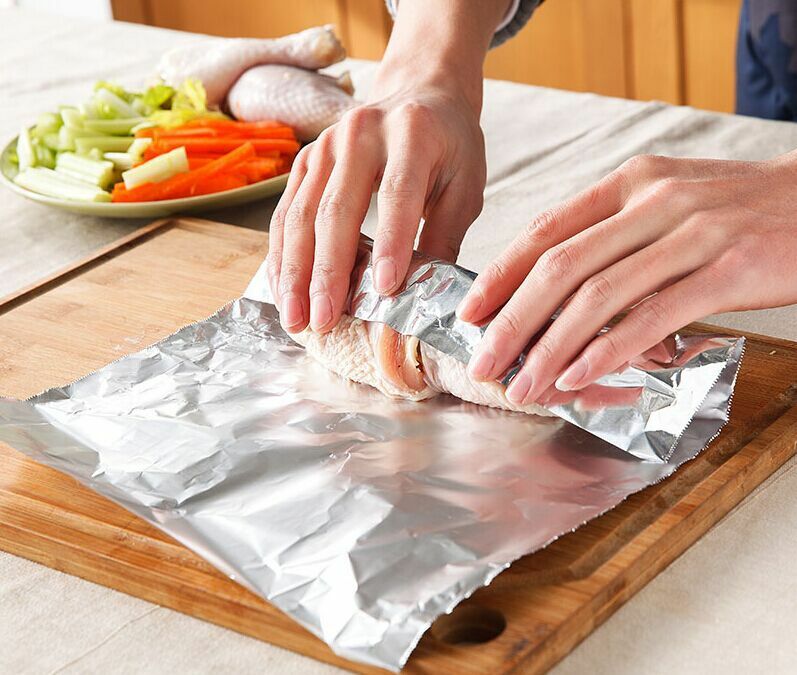 Red meats cooked in aluminum foil increased in aluminum by 89 to 378 percent. Poultry increased by 76 to 214 percent. Turhan, S. “Aluminium Contents in Baked Meats Wrapped in Aluminium Foil.” Meat Science., U.S. National Library of Medicine, Dec. 2006, www.ncbi.nlm.nih.gov/pubmed/22063217?dopt=Abstract&holding=f1000%2Cf1000m% 2Cisrctn. Goldman, Erik. “Aluminum, Alzheimer’s & Autism: Understanding the Connection.” Holistic Primary Care, 26 May 2015, holisticprimarycare.net/topics/topics-a-g/chronic- disease/1701-aluminum-alzheimer-s-autism-understanding-the-connection.html. If you enjoy South Asian and Middle Easter cuisine, chances are you’ve come in contact with a spice called turmeric. It is one of the main ingredients in curry dishes and has a vibrant color and flavor1. One of the main reasons why turmeric has been linked to its main health and medical benefits is due to its active ingredient known as curcumin. A typical turmeric root may contain 2-7% concentration of curcumin1. There are over a million articles on the web and in journals supporting turmeric and its multiple pharmacological activities. Some examples of these benefits are listed below. An anticarcinogen is defined as a substance that counteracts the effects of a carcinogen or inhibits the development of cancer2. Turmeric has demonstrated that it is capable of having an anti-carcinogenic effect on all steps of cancer development. Some studies are currently being conducted to prove that it may also play a part in cancer regression. The protective mechanism of turmeric is due to its direct antioxidant and free radical-scavenging effects. It helps jump start the body’s natural antioxidant system while simultaneously increasing levels of glutathione and other enzymatic processes of the body3. In various studies, turmeric has been reported to exhibit activity against the development of skin, breast, oral and stomach cancers. A study published by the Journal of Biological Chemistry found that Curcumin improves the effectiveness of chemotherapy in breast cancer patients3. Curcumin also promotes anti-angiogenesis, meaning it helps prevent the development of additional blood supply necessary for cancer cell growth. The effect of turmeric and curcumin on the cardiovascular system includes the lowering of cholesterol levels and inhibiting platelet aggregation. A study was conducted on 10 healthy individuals who received 500mg of curcumin a day for 7 days. There was a 33% reduction of Lipid Peroxides, which contributes to a reduction of cell damage. There was a 29% increase in HDL cholesterol and 11.63% reduction in total serum cholesterol. This cholesterol lowering ability is due to turmeric interfering with the intestinal cholesterol uptake and by increasing cholesterol conversion into bile salts4. A study was conducted on mice given aspirin and carbon tetrachloride (widely used as a cleaning fluid). 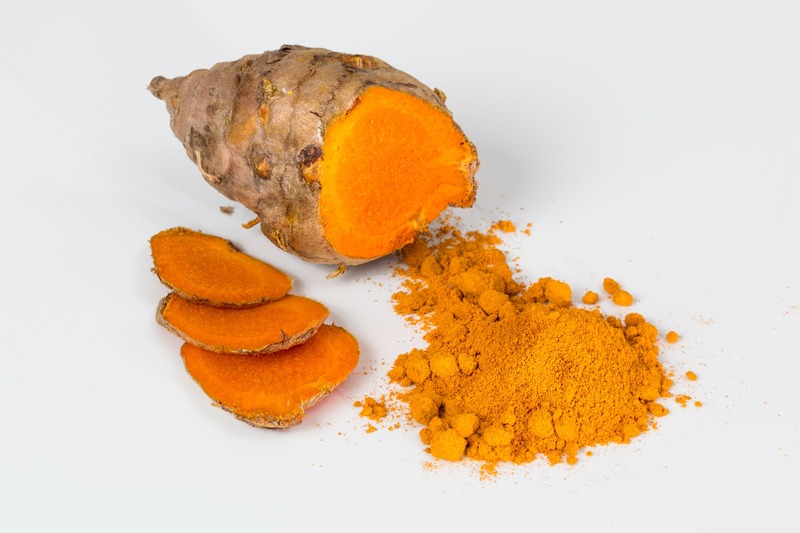 The mice experienced a significantly reduction of the liver blood markers when treated with 100mg/kg of turmeric5. The antioxidant effect of turmeric supports its role in treating liver conditions, especially anti-inflammatory and chloretic effects (stimulating the secretion of gastric acid). This helps with increasing biliary excretion of bile salts, cholesterol and bilirubin6. Turmeric has also been noted to help increase the solubility of the bile, showing great benefit to the prevention and treatment of gallstones7. Multiple studies are currently underway demonstrating the effectiveness of turmeric on the nervous system. Some studies have indicated that a protective role of turmeric on stroke models, including links to the reduction of plaque buildup in models of Alzheimer’s disease8. It also has helped with the reduction of cataract formation on the lens by reducing the rate of cellular death and boosting resistance of the optic lens9-10. One human study was conducted on 16 chronic smokers and 6 nonsmokers. The nonsmokers served as a control group, while the 16 chronic smokers were given 1.5g of turmeric per day. At the end of a 30 day trail period, the smokers who had received the turmeric each day had a reduction of a mutagenic (radiation or a chemical substance) agent in their urine11. The results of the study are quite significant. With the rise of smoke and other environmental cancer causing agents, the frequent use of turmeric appears warranted11. Before considering a dosage for yourself, it is important to consult a nutrition specialist. You can find out the level of your deficiencies and toxicities by getting a comprehensive blood test and tissue mineral analysis. Reviewing results of these testing methods with your experienced nutrition professional can help you understand where to start. By knowing exactly what diet to follow and what supplements you need with the correct dosing, you can control your body’s health status. Get tested today to get started on a pathway towards optimal wellness! 2 “Anticarcinogenic.” Merriam-Webster.com. Merriam-Webster, n.d. Web. 1 Mar. 2018. 6 Ammon HP, Wahl MA. Pharmacology of Curcuma Longa. Planta Med 1991;57:1-7.
constituents induced by sodium curcuminate. J Sci Ind Res 1957;16C: 108-110. 11 Polasa K, Sesikaran B, Krishna TP, et al. Effects of turmeric on urinary mutagens in smokers. This information has not been evaluated by the FDA and is not intended to treat, cure, or prevent any disease. If you have come into our office you have probably heard us talking about the “Terrible T’s” quite a bit. But what are the terrible T’s and what impact do they have on your health? 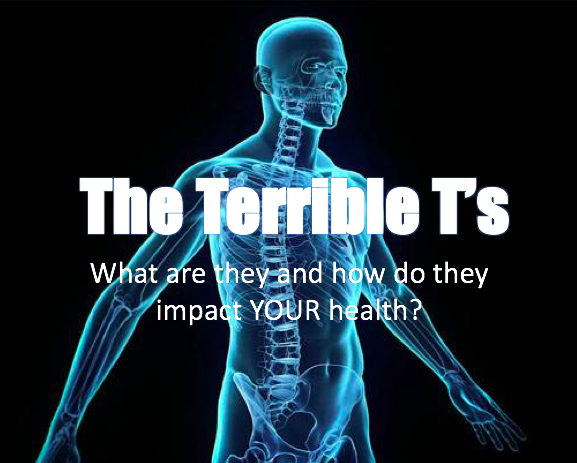 The 3 terrible T’s are traumas, toxins, and thoughts. Each one plays a pivotal role in health in its own unique way. Let’s break these down individually and dive into how they each can affect you. We will start with traumas. Traumas are probably the most obvious T when it comes to the impact they have on your health. Traumas are defined as any injury, accident, fall, bump, scrape, bruise, etc. Traumas are the things you usually can easily remember. They are things that happen that you know caused some sort of pain or dysfunction in the body. For example you recall falling off your bike and hurting your knee or getting in a car accident and suddenly having neck pain. But sometimes traumas aren’t quite as obvious. Think about some repetitive traumas you go through daily. Do you sit at a desk all day? That’s a trauma for your low back. Every time you look down at your phone that’s a trauma for your neck. We are starting to see more and more cases of repetitive traumas causing problems for our patients. So how do we correct for these traumas? Chiropractic adjustments are wonderful for restoring proper joint motion and function following biomechanical injuries to the body. We love seeing the results our patients get even from just a few adjustments of the spine or even extremities! Chiropractic adjustments help to reduce pain, restore range of motion, and get people back to feeling like themselves. The next T I would like to talk about is toxins. Toxins are things that get into your body and cause massive inflammation. That build-up of inflammation can lead to wide spread pain and discomfort. Most commonly toxins are found in our environment in the things we eat and expose ourselves to. Think of your daily routine getting ready. Do you use clean shampoo, do you use deodorant with aluminum, are you using toxic makeup products? It’s important to make the switch to clean and natural products for all of the above to make sure you are protecting yourself. Now think about the foods you eat? Are you eating enough fruits and vegetables? A majority of people are not. Do you eat fast food? Gluten? Dairy products? These things are commonly very toxic and inflammatory for people. This inflammation from food is not always present as symptoms of gastrointestinal discomfort. Sometimes inflammation from food can show up as joint pain, back pain, or even nerve pain. We have seen multiple people who don’t seem to respond to chiropractic care suddenly start to see amazing improvements when we start looking at what toxins are in their environment and remove them. Our bodies were made to thrive and heal and be healthy as long as we remove toxins interfering with that process! The last T we need to discuss is thoughts. This is one of the most difficult T’s for most of our patients to wrap their heads around. Our thoughts are so powerful when it comes to our health. Patients who have a positive outlook on their health generally see much better results in our office. In Chinese medicine they discuss in depth how each emotion effects each organ. Anger congests the liver. Fear can cause problems in the kidneys. Sadness can affect the lungs. In our office one of the most common things we see is stress. Stress is often carried in the muscles of the neck and shoulders. We can help biomechanically by adjusting the neck and stretching the musculature but unless we address your stress levels we may never find the results you are looking for. At Ply Family Wellness we always look at our patients as a whole, not just a list of symptoms. We don’t take neck pain as just neck pain. We will dig to the root of what exactly is causing that neck pain. Was it an accident? Was there some sort of trauma? Is there a toxic overload coming from your environment? Are you overly stressed and holding it in your neck and shoulders? Could it be something else entirely? At our office we won’t settle for just relieving your pain. We also want to make sure that it doesn’t come back. If you are interested in finding out what is causing your ailments please give us a call. We would love to work with you. This is one of the most common reasons people seek chiropractic care. Chiropractic adjustments have been proven to reduce neck pain, back pain, and headaches over and over in the research. Chiropractic care has also been shown to decrease pain from injuries to the shoulders, knees, hips, and ankles.1 Many studies are now showing that the use of chiropractic can even reduce dependence on pain medications. If you have pain of any kind be sure to see your chiropractor to see what they can do for you. If pain isn’t what is keeping you up at night it is likely stress. Chiropractic adjustments have been shown to reduce stress levels which, in turn, leads to more restful and restorative sleep patterns.2 Many patients report getting the best night of sleep they can remember following chiropractic adjustments. This is because of the relaxing response of the nervous system following the chiropractic adjustment. If you aren’t sleeping well, you should absolutely see your chiropractor for regular adjustments. A chiropractic adjustment stimulates the nervous system which is directly linked to the immune system. This stimulation has been shown to awaken the immune system to help the body fight off colds and flus and other illnesses.3 It has been shown that the subset of the population that gets regular chiropractic adjustments gets sick far less often than the rest of the population that does not get adjusted. If you want your immune system functioning at its highest capability you should call your local chiropractor today! 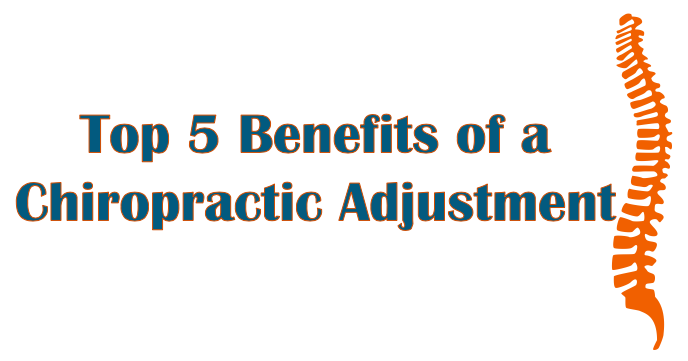 Chiropractic adjustments have so many benefits these listed are just the tip of the iceberg. It is hard to narrow down to just the top 5! Some benefits not listed also include chiropractic for wellness care, chiropractic for pregnancy, reduction in allergies and asthma, reduction in gastrointestinal issues, improvements in athletic performance, and so much more. If you aren’t sure if chiropractic can help you please call our office today and find out! Protein is found throughout the body in virtually almost every tissue and organ. 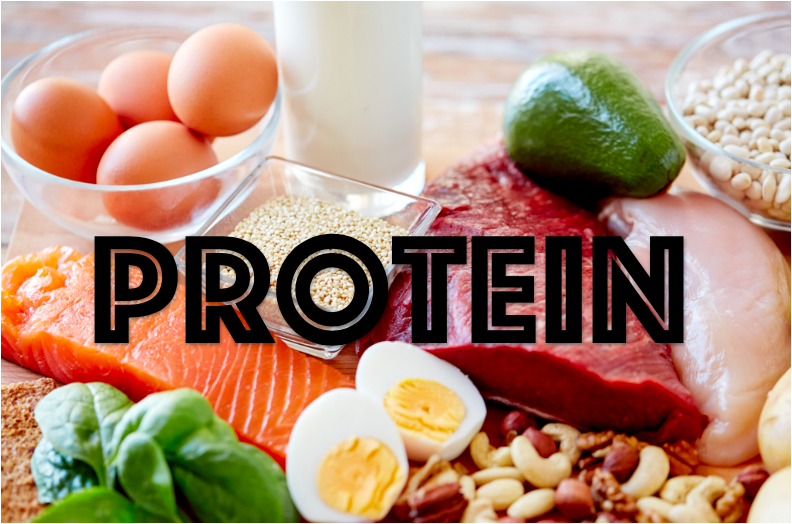 In fact, 20% of the human body is made up of protein.1 The building blocks of protein are amino acids which carry out many roles such as transportation of nutrients, supporting our immune system, healing and repairing of tissue, and help remove waste. The Institute of Medicine recommends that adults get a minimum of 8 grams of protein for every 20 pounds of body weight.2 Beyond that, there’s little information on the ideal amount of protein you need from the diet. Generally, the more active you are, the more protein you will need. Athletes or individuals who exercise on a regular basis may even need up to double the amount depending on the intensity, duration, and frequency of the exercise. Essential amino acids are required to get from the diet because our body does not produce these types of amino acids. If you do not get essential amino acids in your diet, proteins break down, resulting in muscle loss and problems with repair. You can get protein from animal sources and from plant sources. Adding a protein supplement can give the body an extra boost to heal and repair after workouts as well. We will talk more about supplementing protein later on. Most desirable sources of animal based proteins would be fish, eggs, chicken, turkey, and red meat (if OK’d by your nutritionist). If you have a normal serum ferritin and normal serum iron, then 4-6oz of red meat should be OK for you to consume on a weekly basis. Plant based sources of protein would include beans, seeds, nut, sprouts, and quinoa. Nut butters such as peanut butter, cashew butter, or almond butter are good sources as well. Vegans and vegetarians need to be aware of their protein levels. It is very common for these individuals to lack the appropriate amounts of protein for the body’s ability to heal and repair. Chlorella is a good supplement to be taking and is vegan friendly. Chlorella consists of 58% of protein and generally they are about 2 g of protein per 2-3 capsules/tablets. When choosing to supplement with protein for added nutrients to the diet that can help with healing and repairing, you want to be sure to choose wisely. There are many products on the market today which are full of artificial flavoring, colors, dyes, and fillers. Whey protein is one of the most popular supplements however, most are actually harmful. Most whey protein manufactures use a lot of heat for production which actually denatures the protein and makes it insoluble in water. This is why the manufactures add chemicals to restore the flavor and solubility. Also, many whey protein supplements are deficient of the healthy fats, vitamins, and minerals due to the acidic processing as well.4 Genetically modified ingredients, such as soy lecithin, are added as well artificial sweeteners such as sucralose (also known as Splenda). We suggest supplementing with organic hemp protein instead. Hemp protein is ideal because it is a plant based form that anyone can enjoy and it is very easy to digest. When consuming hemp protein you will not only get the benefits of protein but also a hefty serving of fiber and essential fatty acids. Adding more protein to the diet has many benefits and is even necessary in many situations. However, before starting any new diet or lifestyle change it is important to discuss your concerns with your experienced nutritionist. By testing a comprehensive blood panel and hair tissue mineral analysis, we are able to determine other necessary vitamins and minerals you may need to optimize your health. Get tested today to find out where you need to start and to know exactly what to do and what to take for better health! At Ply Family Wellness, we recognize the impacts that pain and dysfunction can have on one's personal and professional life. We are committed as primary healthcare professionals to help our clients resume their lifelong pursuit of health and well-being.